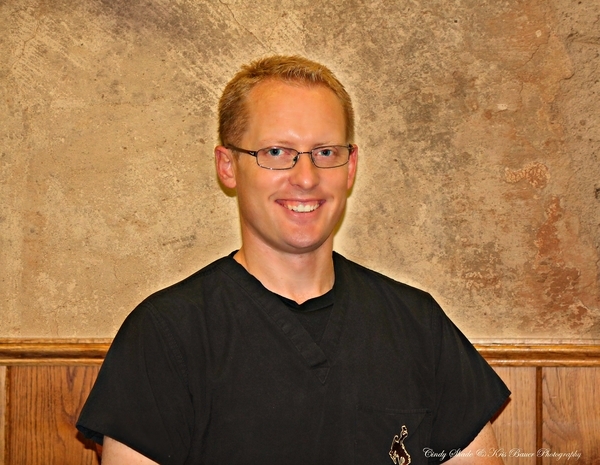 Dr. Hokanson is a native of Newcastle, Wyoming. After Newcastle High School, he graduated from the University of Wyoming with a Bachelor of Science in Biology and Zoology/Physiology. In 2002 he graduated with honors from the University of Nebraska Medical Center College of Dentistry. Since that time he has practiced with Nick in Gillette. Brian is very involved with the American Dental Association, currently representing 7 states on an ADA Council. He is dedicated to continuing his dental learning through numerous continuing education courses every year. He is a scholar member of the Dawson Academy which is a premiere advanced dental education institute in St. Petersburg, Florida committed to quality, complete care for patients. Brian is also a member of the Academy of General Dentistry. Brian is married to Willa, also a native of Newcastle. Together they have three children—Ainsley, Sam, and Bridger. They enjoy camping, hunting, fishing, and sports. They are avid Wyoming Cowboys and Denver Broncos fans. Brian is currently on the Board of Directors for the Cowboy Joe Club at the University of Wyoming. He is also president of the Gillette Edge Soccer Club and coaches youth soccer as well.